Hypnobirthing is based on the idea that the majority of pain experienced during labor is caused by fear and tension. It employs hypnotherapy and other non-pharmacological practices—relaxation, visualization, etc.—to lessen pain and in many cases decrease the duration of labor. This was certainly true for Marina; Oliver was delivered after only about five hours. Chad was thrilled that Oliver would be with them to celebrate Father’s Day, which was less than a week away. However, things didn’t exactly go as planned. Like countless newborns, Oliver developed jaundice. Jaundice occurs so frequently that many doctors consider it a normal part of the first few days of a baby’s life. Most cases are short-term and ultimately harmless. But once in a while jaundice escalates and becomes a very dangerous condition that can result in hearing loss, brain injury or worse. Flight Nurse Jennifer Fennerl prepares for takeoff. Although Oliver wasn’t acting lethargic or distressed, he was clearly jaundiced. The midwife advised Marina and Chad that if he still had symptoms when the weekend arrived, they should take him to a hospital for bilirubin testing. Bilirubin is a byproduct of the normal breakdown of old red blood cells. The reason healthy newborns develop jaundice is because their immature livers are slow to process bilirubin. The weekend came and Oliver still had symptoms, so the couple took him to Mendocino Coast District Hospital. When the results came in, even the doctor was surprised. Oliver’s bilirubin numbers were the highest he’d ever seen. He decided to request an air ambulance to have Oliver transferred to a pediatric specialty hospital. A flight team from REACH 1 in Santa Rosa quickly headed to Fort Bragg to pick Oliver up and transfer him to UCSF Benioff Children’s Hospital Oakland. 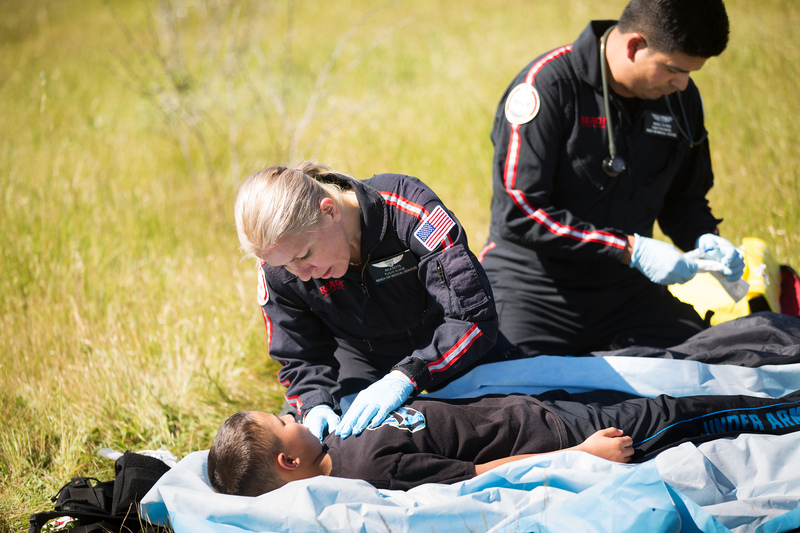 REACH has been working with Oakland Children’s Hospital for over 20 years as their primary provider of air ambulance services for critically ill and injured children. Flight Nurse Kyla Betts cares for a patient. Kyla Betts also has the job she’s wanted ever since she was young. 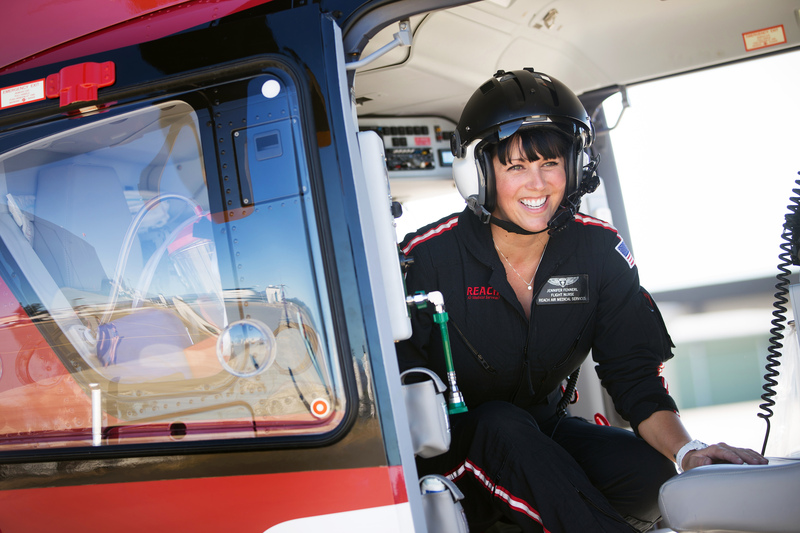 “Oh, I definitely wanted to be a flight nurse, and REACH had the kind of program I wanted. It seemed unachievable, but I just kept plugging away and plugging away.” Kyla’s not joking. “I started as a hospital bed maker at minimum wage, but I was so happy! And I knew I was headed toward my goal.” Kyla has been with REACH since 2011. Kyla says that as a nurse, she truly loves taking patients to Children’s Hospital. “They’re amazing. They’re so receptive and I feel like there’s a lot of trust between us,” she states. 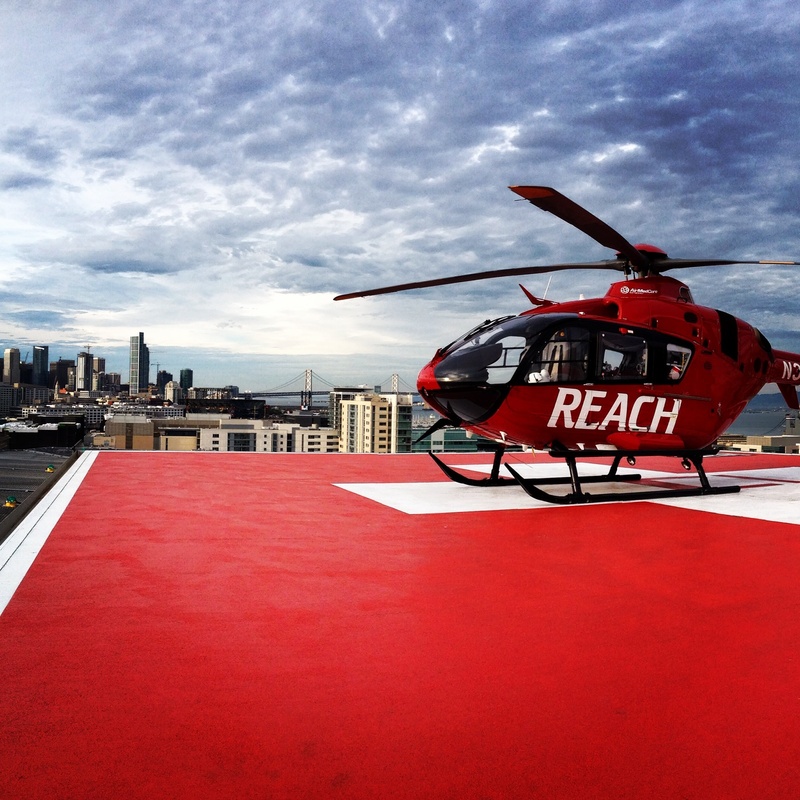 The REACH 1 aircraft on the UCSF Medical Center helipad. In the ICU, Oliver started phototherapy. This treatment uses a specific type of light that makes it easier for an infant’s liver to process bilirubin. “They thought they were going to have to do a complete blood exchange, too,” Marina shares. (In rare cases of severe jaundice, an exchange transfusion is required to avoid neurotoxicity.) Fortunately, after a few hours under the lights Oliver’s numbers went down significantly, making a transfusion unnecessary. After his release, Oliver just kept getting happier and healthier. A blessing for the couple is that they are both teachers, so they had the summer off to enjoy and care for their new son together. Another positive was that Marina was able to start breast feeding with the help of a breast pump. And because Oliver temporarily drank formula and will now take a bottle, Chad can enjoy feeding him, too. Marina is also very positive about the value of their family’s REACH for Life membership. * The expense of the REACH medical team and air ambulance flight to Children’s Hospital was covered by their membership, so the couple can now focus on saving for Oliver’s future. REACH is extremely pleased to hear this good news and wishes Oliver, Marina and Chad abundant health and happiness.